Many of my spring breaks consist of relaxing at home, but this year was much different. This year, I had the privilege of having a wonderful traveling experience in England, my dad’s home country. My dad is the soccer coach at Central College, and once every four years, he gets to take a trip to another country with his team. This year’s destination was England, so my family and I decided to tag along on the trip with them since my siblings and I have never been before. Before going to England, the only other country I had ever been to was Canada. However, thanks to my dad, I was not ignorant to British culture. The first stop on our trip was London. We stayed there in a hotel for only a few days, but there were so many amazing things to do there! We spent a whole day riding the London Underground and getting off at different destinations to see what we could find. It was really exciting to get out at Westminster and see Buckingham Palace up close. Another one of my favorite places from the Underground was Piccadilly Circus, which is basically like the Times Square of England. As well as traveling on the Underground, we also toured Wembley Stadium, Anfield, and the Tower of London. We even rode on the London Eye, but unfortunately Big Ben was under construction and we couldn’t see it very well. Our next destination in England was a city called Chester, which was my favorite place we went to. Our hotel was in a historic area, so we did lots of walking around and looked at all of the old buildings. We did little excursions into town some days to walk around the shops and see what we could find. One day, we went all the way to Liverpool where we toured the Beatles museum and went to a real English Premier League soccer match! 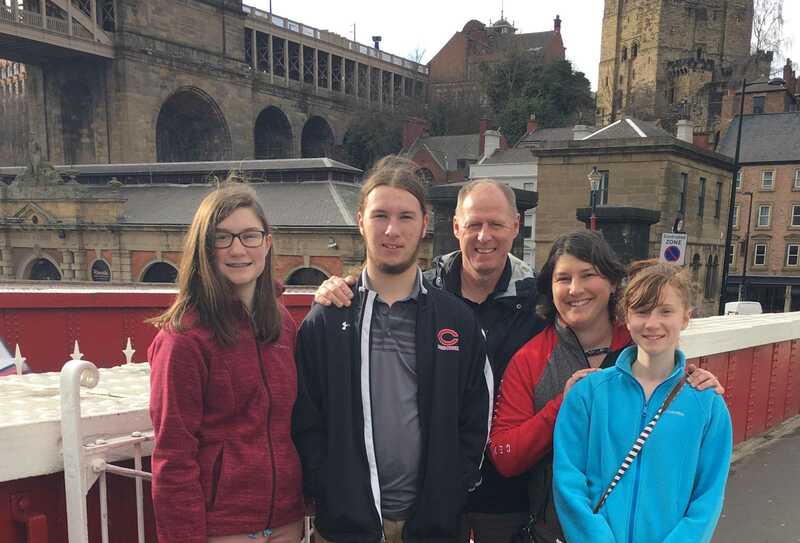 About a week had passed by the time we were done in Chester, and my dad’s team headed home on their own, so my dad and our family could have another week to go to his hometown of Gateshead and visit all of the family I had never met before. We stayed at my Great Uncle Tom’s house while we were there, and he was able to drive us everywhere we needed to go since we no longer had the team bus. While in Gateshead, we went over to the City Center in Newcastle, to South Shields to see the beach and the North Sea, and to Saltwell Park to walk around and explore. It was so great to finally see where my dad was from, and I really enjoyed spending time with all of my family. I also learned a lot about my family’s roots and culture, and what life was like for my dad growing up. Even though this trip was just for fun, I actually learned a lot through the process. There were many things about England that surprised me and were unexpected. When we were in London, I was very convinced at times that we were the only English-speaking people there! The city was very culturally diverse, and it was quite eye-opening. When we got to Chester, though, everything turned much more British. There were some aspects of England that were difficult to get used to, like the fact that they drive on the left side of the road. The traffic is insane, and to make matters worse, the lanes are extremely close together. I actually got used to the food quite quickly and ended up discovering a lot of new good foods, such as pasties and sticky toffee. One of my favorite things from this vacation would definitely be getting to meet so many amazing people. Not only did I get to meet my family, but I also met lots of strangers that were very nice and came from all over the world. Our tour guides were also amazing and hilarious people, and I will always remember them. Visiting another country really opens up your eyes to a new culture and a totally different way of living, and it’s such an amazing experience that I hope everyone gets to have some time in their life.